Carolyn Brown, Professor of Flute at the University of Central Arkansas and Principal Flute with the Arkansas Symphony Orchestra, began her musical education as a young girl, studying piano with her mother and flute with her father. She continued her education at Wartburg College, UMKC, KU, and received her doctorate in Flute Performance and Literature from The Eastman School of Music in New York where she studied with Bonita Boyd. 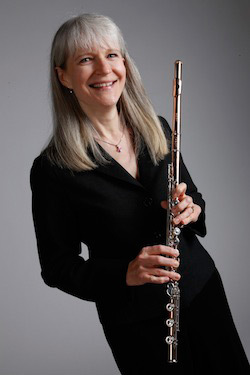 During her residency at Eastman, she was the only woodwind candidate to be unanimously nominated by the Eastman faculty for the prestigious Performer’s Certificate. Carolyn has been the top prize winner in a number of competitions, including the Myrna Brown Artist Competition and she has been a featured soloist with the Arkansas Symphony Orchestra several times. She and her husband, pianist Carl Anthony (keyboardist with the ASO), perform frequently throughout the U.S. as the Dionysus Duo. The duo performed in recital for President-elect and Mrs. Clinton shortly after he was elected in 1992 and the duo has performed at numerous National Flute Association conventions. Their international travels have taken them to Asia and South America where they performed recitals and taught masterclasses. When she is not performing or teaching, she enjoys playing with her grandsons, Evan, Aedan, and Olin, waiting on the family's four cats: Ronnie, Sookie, Siri and Rosey, and watching professional tennis.